One of our pet chickens. The craziest things can and do happen at our house…. The past two months have been such a dizzying whirl that in July our birthday calendar was still on the May page! We had two family gatherings, thousands of miles on the road, gardening, birthdays, an anniversary, get-togethers with friends, many visitors, 23 chicks, the end of the hockey season, Canada’s rainy 150th birthday, and slow but steady homeschooling…. There were very happy moments and incredibly sad ones, and sometimes it was all completely overwhelming. It is such a comfort to remember that we belong to Jesus. 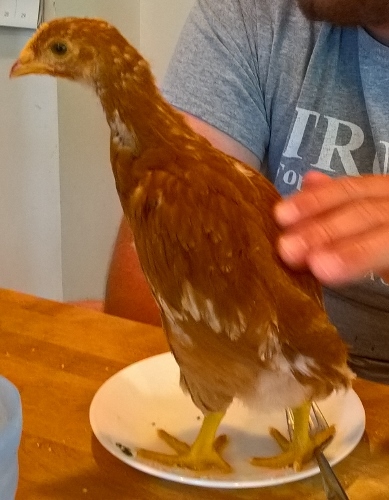 Highlights of the past two months include watching Miss 14’s pet chickens grow. When she hand feeds them lettuce and dandelion leaves they are wildly eager for each yummy green bite, and Bunbun hops up to beg for her share, too. Other highlights: Miss 24 has graduated from university, Miss 17 is learning to drive, our road has been newly paved, and we finally have a Costco membership. Homeschooling continued these past months, slowly. Almost every day we did little bits of Dutch, French, logic, Bible, literature, science, math, and more, and when there was work or another interruption, we caught up the next day. Some days we also studied Canadian history and literature. Because it was a slow school year for both girls, we are planning to continue studies throughout much of the summer. I remember a public school mom who set her children learning and exercise goals throughout the summer, and our homeschooling goals are not much more than that if the girls focus. Summer is also the time to prepare for the next school year. Cathy Duffy’s 102 Top Picks is helping me plan the year, and I’m also gaining inspiration from Nancy Pearcey’s Total Truth as well as Brandi Vencel’s church history suggestion to read the actual documents instead of books about them. Miss 17 likes the idea, and with the help of Omnibus II it should be possible…. It is also necessary to rest. My husband says I’m too earnest; I still have not figured out what that means, but I do know I’ve been too overwhelmed too often lately. Last year I was so ill that I quit playing the organ, but now I need that music time desperately so I’m slowly strengthening my arms to be able to play regularly again. I’m also trying to be outside in the early morning freshness, to relax by reading both serious books and fluff, to simplify, and to say ‘no’. I occasionally manage to walk 10,000 steps a day, but the steps are spread throughout the day and I need to take it easy the next day. A solid walk is just not possible for me right now. It is difficult to gain strength and endurance, but if I don’t try to gain I will only lose what I am currently able to do, so I keep pushing against my boundaries. Last summer and fall I was increasingly dizzy and that went away with B12 supplementation, which I quit in the spring. Since then I’ve become dizzy again but now that I’ve started taking B12 again that is slowly going away and I’m hoping to gain some energy as well. In the past two months I have become much more familiar with Romans 5-8, but have not actually memorized much. Because I’m sleeping better, I write less wee notes to myself at night. That means less to do lists, less ideas for articles, less insights. And, really, that is fine. Celia Barker Lottridge’s Ticket to Curlew, Wings to Fly, The Wind Wagon, and Home is Beyond the Mountains. Janet Lunn’s A Rebel’s Daughter, about the 1837 rebellion in Canada, and Maud, a surprisingly cheerful biography of L. M. Montgomery’s youth, celebrating family and food while also describing difficult times. Stephen Leacock’s Nonsense Novels, a hilarious introduction to literature. One Dominion which pointed out that Canada has a strong Christian background and Christians today have a duty to develop a Christian vision on all of life (Total Truth, again). The girls are also enjoying Wodehouse, Lee Child, and Garfield, as well as a lot of light Christian novels. My health reading in May and June included Nourishing Broths (worthwhile) and Nourishing Fats (less info, more hype) that I skimmed during a long drive to my sister’s place (and then gave her for her birthday). I also finally finished Explain Pain, a very worthwhile book for anyone impacted by chronic pain. homeschool prep—I will be using Omnibus II as a background for Bede (via the Ambleside Online summary), as well as for Eusebius’s The Church History and Athanasius’s The Incarnation. I may also leaf through Tim Tebow’s Bible study, Shaken. And I’m going through 102 Top Picks to guide the homeschool planning. on hold for now—Bavinck; Resolving Conflict; Love, Honor and Virtue; Growing in the Gospel will all have to wait for a while. My personal Bible reading has stabilized a bit and I’ve read Luke, John, and part of Acts, although I am continuing to float around a lot, too. Once, after receiving yet more bad news, I set my audio Bible to Psalm 13 and somehow it moved on to Psalms 113, 130, 131, 132, 133, and 134, all of which I listened to over and over while driving. What a gift that was! Of course, I’ve been spending a lot of time in Romans in the hopes of someday memorizing it. Isaiah 29, Philippians, and John 14 also taught me much, this time in relation to the concepts in Total Truth. Sometimes reading the Bible can seem humdrum. Looking at it from the point of view of an all-encompassing book like Total Truth makes it all seem new again. So does searching it for wisdom when we are dealing with difficult issues. But the most beautiful approach to the Bible I encountered recently came from a young Christian who called me, overjoyed with a new understanding she had of a certain Bible chapter. She said that God’s Word is so sweet, she ‘wanted to share the candy’ with me! For mealtime devotions the girls and I read from 1 Corinthians through Colossians and then skipped to Isaiah (“because we’re catching up to where Daddy’s reading, Mom, and I can’t remember reading Isaiah”) all with frequent forays into Psalms and Proverbs when one of the girls was away. When my husband was home for meals, we read from I Thessalonians to Hebrews. And so passed another two months of life, a gift from God that I misused and marred with sin, but a gift none the less. I am grateful for it. May God forgive all our foolishness, failures, and sins and help us love and serve him and those around us in the time he gives us this summer. If you enjoyed this wrap up, you might want to follow me on Google+ where I often mention helpful or interesting ideas, or connect with me on GoodReads where I (eventually) share what I read. Recently finished ‘The Weight of Glory’ which was top knotch. Re B12 – a few years ago my Mum started showing signs of Parkinson-like symptoms or some sort of neurological condition. It turned out she her extremely low levels of B12 were to blame. Quite a dramatic tun around when she started B12 injections. Thank you, Carol. I look forward to reading how you use Athanasius in your homeschool. And Weight of Glory is now on my reading list. I don’t think I’ve ever read it before. Thank you, also, for the info about B12 and your mother’s condition. I will pass that on. Sounds like a very busy but good couple of months for you and your family. Yes. Rest. Read some more fluff!! You are truly, too earnest. Thanks for your comment, Kathleen. The organ progress will probably not be stunning, but being able to play for a decent amount of time again will be wonderful. Total Truth has been a blessing to so many, and I’m thankful it is for you, as well, and for that math teacher. Your fractal comment reminded me of Jason Lisle’s talk on fractals. https://www.youtube.com/watch?v=nkwCl0ymTfg If you haven’t seen it yet, I know you will love it. Yes, I’m reading fluff. Look for some fluffy reviews coming up! And I’m resting.